This 300 large piece jigsaw is designed by John Sloane and measures 46 cm x 61 cm. On a bright spring day, a couple prepares a car in front of their house for a morning drive. Available in two-piece counts. Bunny Bouquet is an adorable 300 large piece jigsaw puzzle by artist Jane Maday. Here, three bunnies play on a tabletop. Each is wearing a purple ribbon tied into a bow around his neck. One bunny is nestled in a pot of bright flowers, including daffodils, daisies, and irises. Two birds and butterfiles watch these furry friends. Available in two-piece counts. 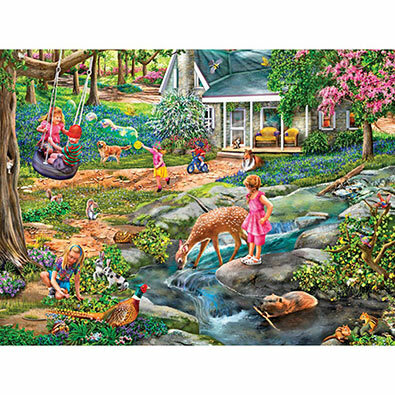 Lakeside Retreat is a 300 piece jigsaw puzzle designed by artist Abraham Hunter. Fall colours are in full display on the lakeside shores where a rustic cabin and row boat are illuminated by the setting sun. Available in two-piece counts. This 300 large piece jigsaw puzzle is designed by Debbie Cook and measures 46cm x 61cm. Available in two piece count. This 300 large piece jigsaw is designed by Sandy Rusinko and measures 46 cm x 61 cm. This puzzle depicts a normal day in a bountiful general store. Available in two-piece counts.